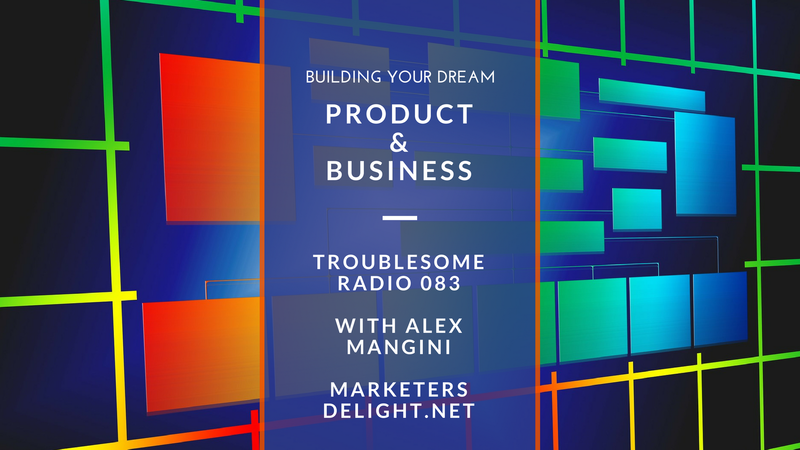 In episode #83 of Troublesome Radio, I invited Alex Mangini (@aamangini) on to the show to discuss building products, websites, and blogging. Alex is the creator and designer of Marketer's Delight. Alex's backstory---how he sold his first website at a raw 18 years old for a cool $20,000. Does he have any regrets about it? How to overcome the beginning struggles of being an entrepreneur. Most importantly, Alex talks about how you MUST be the biggest advocate of your own product, every time. How to measure the DEMAND for your product in the marketplace---which is probably the most important thing you must do (and a mistake I've made). In addition, how you differentiate yourself in an already-crowded market. Can you CREATE a market? Or is it best to "do better" than current products in the market? Alex shares his thoughts on this. Is it worth it to have business partners? Alex and I mostly agree on this. Programming---is it worth it to learn, and if so---where do you start? Finally, what's coming up for Alex and his business. Again, this is 70+ minutes of killer advice from two people who have made a lot of mistakes in our own businesses. Alex and I are both a bit young, and definitely don't know everything---but we do know a thing or two. Enjoy the episode and let us know what you think! While I'm a huge proponent of one of Alex's competitors (and inspirations! ), Thrive Themes, I'm actually about to take Marketer's Delight for my own test drive (on a new niche site I'm about to start building as early as this week). I can't wait to give it a shot and review MD, too!